We said goodbye to my sister and BIL, and hit the road for a long day's drive to our next destination: the Black Hills of South Dakota. Once we hit Sioux Falls, we started traveling west...and the wind started blowing. We left the corn fields of Iowa and headed into yet another new state for me. When we crossed the Missouri River, it was like driving into a whole different world. The landscape had been flat, just about the flattest land I've ever seen, and then we went down a hill, crossed the Missouri, and....BOOM! There was this one cloud that was just drifting along by itself. Then the landscape got somewhat flat again with buttes and rocky hills scattering the countryside. 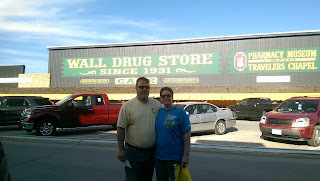 Once we got to Wall, we stopped for dinner and a quick look around at Wall Drug Store. If you don't know the story of how it began, there was a young married couple; he was a pharmacist. They were looking for a place to settle; the 1 condition they had was that there had to be a Catholic Church. There was one in Wall, so that's where they opened their drug store. The problem was that no one was stopping. 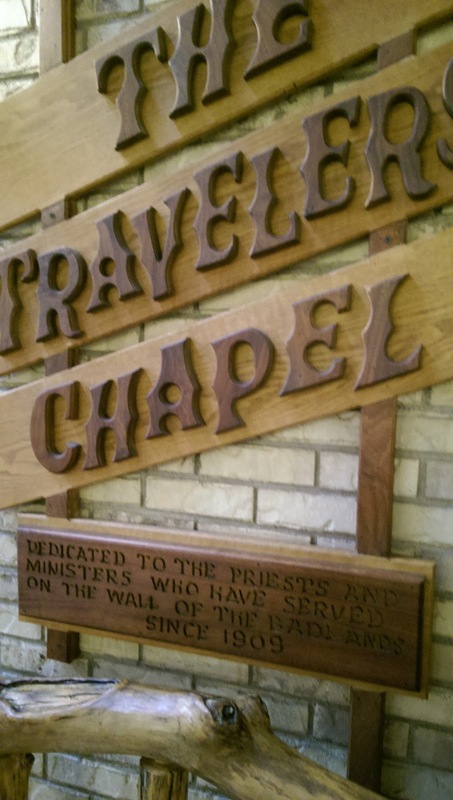 In the summer heat, the wife told her husband that they should advertise free ice water to travelers. After doing that, their business started booming. To this day, they advertise free ice water. After Wall, we had about another hour's drive to our campground...the place that would be home for the next week. It didn't take us very long to set up camp and get comfortable in our new home. Our campsite was perfect. There was a flat space in the back of our site; it was perfect for YS' tent. 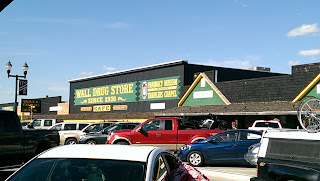 For a full review of the campground, see our Flyin' the Coop blog. So, now that we're there, there's more adventures to come! SD is definitely on my list. Hubs went pheasant hunting out there and absolutely loved it. I love the way the landscape in America changes as you move East to West. How exciting!! I didn't realize you'd pulled your camper with you. Have a great time!!!! Looks like a wonderful time, Mary! 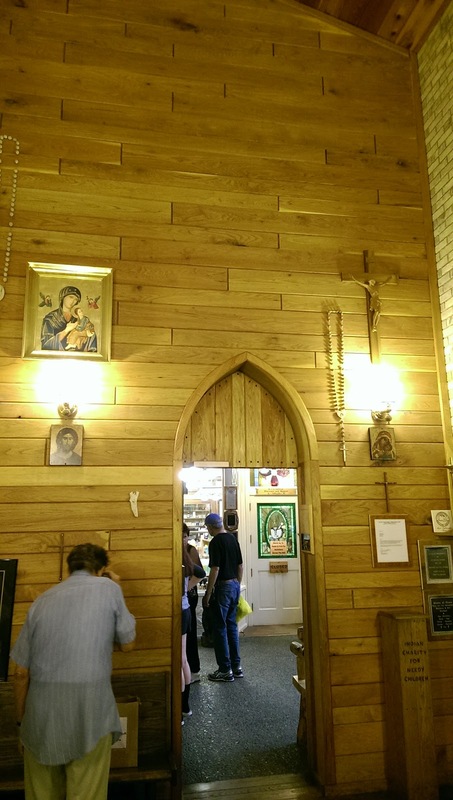 Really enjoyed seeing all your beautiful photos! Can't wait to hear more about it...safe travels! 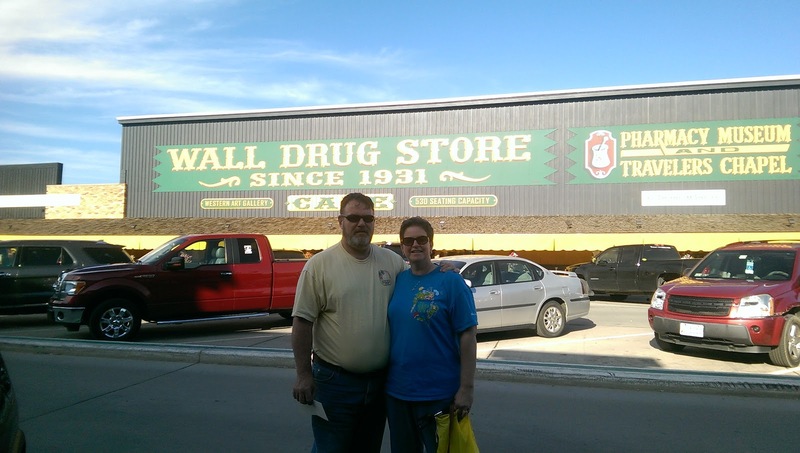 What a great story about the Wall Drugstore! 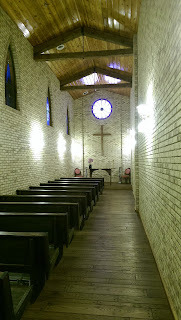 That little chapel is beautiful! I'm loving your vacation and can't wait for the next installment and more amazing photos! Fun!! And love that story. The scenery is just gorgeous, Mary!